What is an Affidavit of Small Estate? A Small Estate Affidavit form is used to help simplify the probate process. In most states, this document can be used if the value of the estate is worth less than $150,000. 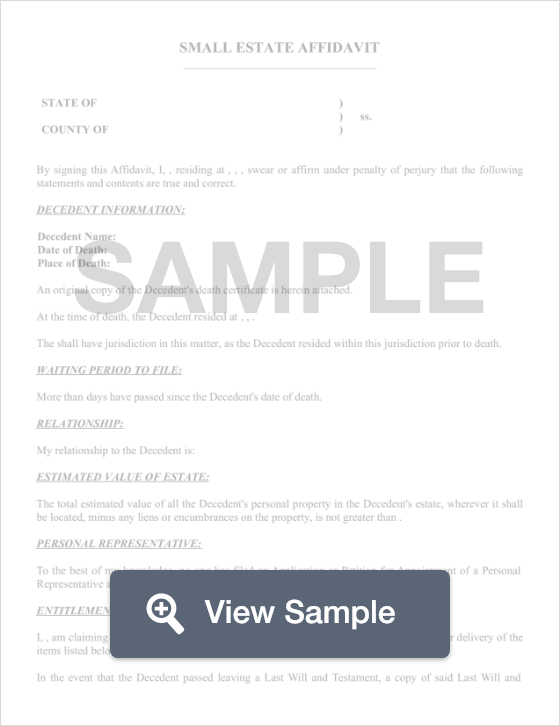 Generally, the surviving spouse or an adult child of the decedent would complete this form and have it notarized before providing it to the probate court in the county where the decedent lived at the time of death. If accepted by the probate court, the decedent's entire estate is transferred to the surviving spouse or the adult child or children who filed the form. In states with community property, the process may be a little bit different if there is both a surviving spouse and at least one adult child. A small estate is usually considered to be an estate that is worth less than $150,000. An affidavit for a small estate can be included in a deceased person's Last Will and Testament, or if they didn't create a will, a relative such as a spouse or adult child will complete it. This affidavit should include a description of all items included in the small estate and a fair market value for each item. This includes any properties in the estate. Once signed, this affidavit becomes a legal oath, so double check the information before completing it. A small estate and affidavit of heirship are both forms that are used when someone dies to speed up the probate process. Small estate affidavit - transfers all property to an estate’s heirs without going through the probate process if the total estate value is under a certain threshold. Affidavit of heirship - used to identify the estate’s heirs, sometimes attached to a small estate affidavit, if the estate involves real property, this is usually filed with the county recorder. Create a free Affidavit of Small Estate in minutes with our professional document builder. You can use this document to obtain control of property that was owned by the deceased and power of attorney. If you present the affidavit to a person, company, or bank that is holding estate property, they are legally required to turn it over to you. This document is used to fast track an estate through probate court. It is a good way to resolve the estate of a person with a “small estate” who has died without a will. This affidavit cannot be used if an estate is already in probate court. A small estate affidavit form is used by the family of someone who died to avoid a long probate process in courts. Do I have the legal right to inherit the property? You may only use the small estate affidavit if you have a legal right to inherit the property. The people with a legal right to inherit property include beneficiaries in a will or a heir if a person died without a will. If the deceased died without a will, your state law will determine who is the legal heir by looking a the relationships of the people that are claiming to be heirs, the type of property, and any other issues. If you are not sure if you qualify to inherit a piece of property, you should consult legal counsel. An affidavit of small estate is sometimes known as a small estate affidavit. An affidavit of small estate is signed under oath and informs the probate court that the deceased did not have much in the way of assets. 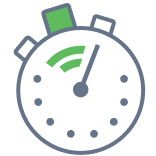 Filing this document with the court can speed up the probate process. An affidavit is a sworn statement. The purpose of an affidavit is to take facts that someone is reciting regarding a particular incident. Affidavits can be used for business or legal purposes. The purpose of a Power of Attorney is to enable you to legally give another person the permission to make decisions on your behalf. Depending on how the Power of Attorney is drafted, the other person may be only able to make certain types of decisions for you and it could be on a temporary or permanent basis. An affidavit of death is a statement that is signed under oath by the executor of an estate. It names the person who died and includes other pertinent information such as identifying factors and the date of their death.